Intelligent, across-the-board email security - whether for on-premises, cloud-based, or hybrid email systems - begins with a clear, realistic understanding of what you’re up against. Email is the most common way for cyber criminals to launch and distribute threats. As the volume of these attacks has increased, so has the level of sophistication. Advanced and zero-day threats are much more difficult to detect and stop than traditional malware, while standard signature-based antimalware tools have proven largely ineffective against them. Organizations are struggling to prevent sensitive data from being exposed as users share sensitive information over email. This data must be kept secure and private to meet security, legal, and compliance requirements. Exposure can result in damaged brands and reputations, regulatory fines, and, ultimately, financial losses and even financial destruction. 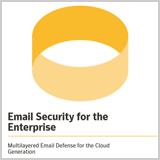 Symantec provides the industry’s most complete cloud and on-premises email security portfolio. This protection comprises multiple layers of security technologies. Protecting email on Office 365, Gmail, and Exchange.